True to its name, the International String Trio has honed an expansive repertoire embracing nearly a dozen styles from far-flung lands. Employing their instruments as passports, the adventurous triumvirate unlocks the doors to a global array of tunes drawn from jazz, folk, popular, classical, film and other sources. Featuring Russian-born guitarist Slava Tolstoy, British violinist Ben Powell and American acoustic bassist Greg Feingold, the IST’s players embody its cosmopolitan aesthetic. 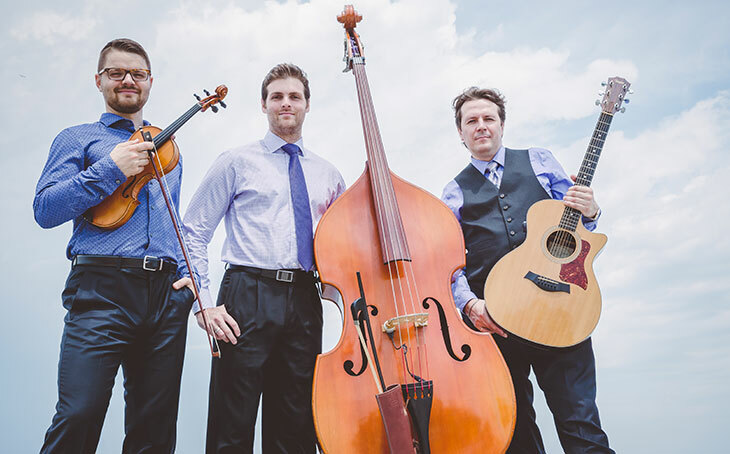 The trio’s riveting performances encompass a breathtaking range of styles, including Gypsy swing, old-time Appalachian laments, traditional Irish reels, celebratory klezmer, passionate tango, graceful French musette, and burning bluegrass. While steeped in jazz, they play intricately arranged music that leaves room for improvisation without focusing on it. While the IST owes its success largely to its superlative musicianship, enthralling performances and original concept, there’s a practical side too. As a compact trio the group is economical and highly portable. Comfortable in intimate chamber settings, concert halls or large auditoriums, the IST performs about 120 shows a year at the PAC’s, festivals, jazz clubs, schools and universities. As accomplished educators, the trio often offers outreach programs as part of their engagements, from master classes to music introduction workshops. Adept at taking listeners on a far-flung journey, the trio offers insight into more than a dozen cultures around the world. For this special Winter Fest performance, the IST will be joined by vocalist Emily Day. Currently based in San Francisco, Day was raised in Chicago and Vermont then trained in New York and Europe. Over the years, she’s had the honor of sharing the stage with Ray Vega, Maynard Ferguson, Reggie Workman, Jane Ira Bloom, Armen, Donelian, Junior Mance, Sheila Jordan, Kenny Washington, CAlifornia Honeydrops, Lavay Smith, and Amos Lee. She’s a graduate of the New School and holds an MA in Popular Music Studies from the University of Liverpool. This appearance of International String Trio featuring Emily Day is supported, in part, with funds provided by the Western States Arts Federation (WESTAF) and the National Endowment for the Arts.